Beachfront w/ pools in great location! "Lighthouse 1402" features all the comforts of home. An oasis in the sky!! Get ready to relax and enjoy spectacular views, exceptional amenities, and the world class beaches Gulf Shores has become famous for! The condo features professional decor, wireless internet access, cable TV, and a kitchen equipped to prepare simple meals. Sit out on your direct gulf-front patio and enjoy your morning coffee and newspaper while the dolphins frolic in the surf! 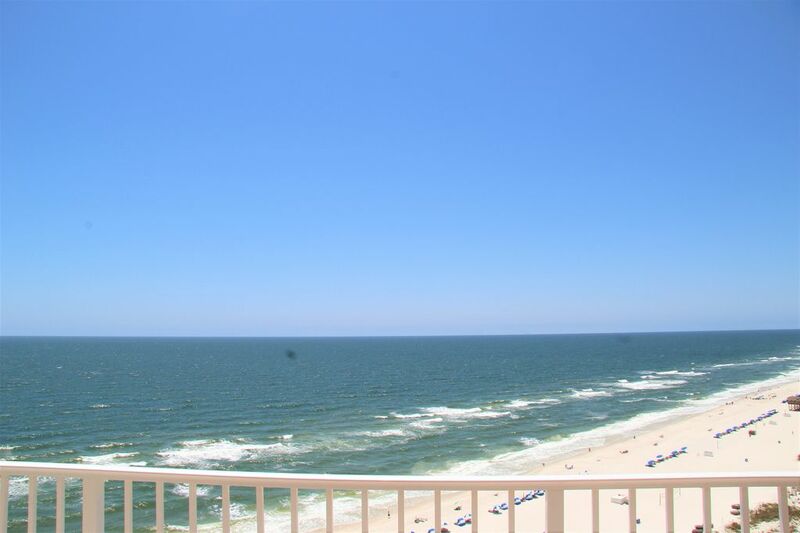 Located on the 14th floor and right in the heart of Gulf Shores. Lighthouse boasts two gorgeous outdoor swimming pools (one zero entry), an indoor swimming pool, fitness center, two saunas, and a hot tub. "Lighthouse 1402" is located at 455 East Beach Blvd, Gulf Shores, AL 36542. "Lighthouse 1402" sells parking passes directly on site. When you arrive at the condo complex purchase your parking passes. Keep your parking passes visible in your windshield through out your entire stay. Parking passes are strictly limited to only 2 per unit, per the condo complex. No RV's, trailers, or boats are allowed in the condo parking lot. You must take all hitches off vehicles while in the condo parking lot. No Pets Allowed in Condo. No Pets Allowed on Beach. Lighthouse unit 1402 features all the comforts of home. Professional decor, high speed wireless internet access, cable TV, CD/DVD player, and a view that will truly take your breath away. Sit out on your direct gulf front patio and enjoy your morning coffee and newspaper while the dolphins frolic in the surf! One of the newest condominium complexes on the Gulf coast, the Lighthouse boasts two gorgeous outdoor swimming pools (one zero entry), an indoor swimming pool, fitness center, two saunas, and a hot tub. There is truly something for everyone. This is a GREAT property. I had read previous reviews and they all noted that the air conditioner did not cool. This is true. We slept with the balcony doors open. The only other issue is that the trash compactor stinks. I reported this so I am sure it will be taken care of. Other than those issues it was Wonderful and I would highly recommend this property. It was perfect for our needs. We had a great time at the condo. We went to the gulf coast for a soccer tournament and stayed a few extra days at the condo. We are so glad we did. The pools are great the beach and ocean was beautiful from our condo. We went to the Owa Amusement park, dolphin watching, ate at the Diner, walked to the hangout, did a little "crabbing", walked to the Waffle house one morning, walked to the shops to get a couple mementos. We had an over all great time. The condo was perfect for what we needed but needed some deep cleaning. I am sure its hard with the storms and hurricanes but there is a good amount of mold around the patio doors and curtains and the master shower leaked. We turned our noses up and had a great time anyway. Sounds like you had a great visit! Yes, the location of Lighthouse 1402 is super convenient with great views. We will pass along your comments to the cleaning crew but you are correct, the humid gulf air does present some challenges.. We hope to see yo again soon! Except for the rain,we had a great time. Really loved the view. It was clean but no coffee filters, extra toilet tissue or paper towels. There also was no hair dryer. They also forgot to put pillow cases on our pillows but after a call they came right away. Our condo is a privately owned home, not a hotel. We provide starter amenities as a convenience for our guests and cannot promise hair dryers. Most guests stock up on paper towels, etc at one of a number of stores mot far from the condo. Good overall stay. Location was Great. View was as good as it gets with large balcony, balcony furniture a little warn but ok. Beach was easy to get to. A couple of lights out and air not super cold but ok. Good floor plan and space. We would stay here again. Thank you! We look forward to seeing you again soon. This property is well located in Gulf Shores. Getting to it and around the area are both very easy. Check in and check out were electronic and I had no other contact with property management. The unit was clean and had everything I needed for my stay. Considerations you should make before selecting this unit are that it is a top floor unit. This was a mixed blessing. It was nice to be able to be out in the sun and have the amenities of hearing the ocean but also your condo right there. However, it was rainy most days I was there and you&#x2019;re not able to enjoy the ocean from your porch then, so I had only about 3 hours of ocean time a day. To me, sitting and hearing the ocean is a big reason I go to the beach. Again, this would be personal preference, but a consideration to make. We're sorry the weather did not cooperate during your vacation. Luckily, most of the time the weather is wonderful and you can enjoy the sounds of the beach from the beach and enjoy the magnificent view on the 14th floor from the condo! Best of both worlds! Gulf Shores offers wonderful restaurants, great shopping (Foley outlets are a favorite of the ladies), world class golf (Kiva and the Peninsula), and great movie theaters. The kids will enjoy various amusement parks, putt-putt golf, and go-cart tracks.